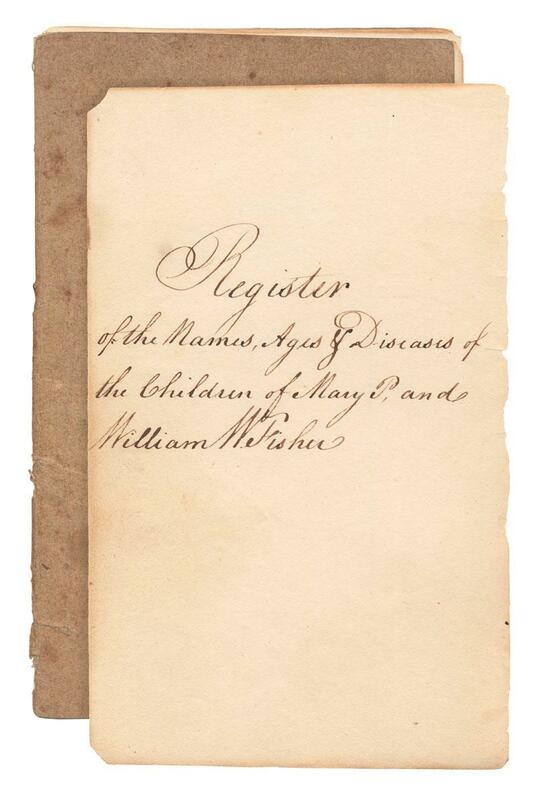 This register, found tucked into a family Bible, catalogs childhood diseases and vaccinations of the nine siblings in the Fisher family, who lived in Philadelphia in the nineteenth century. 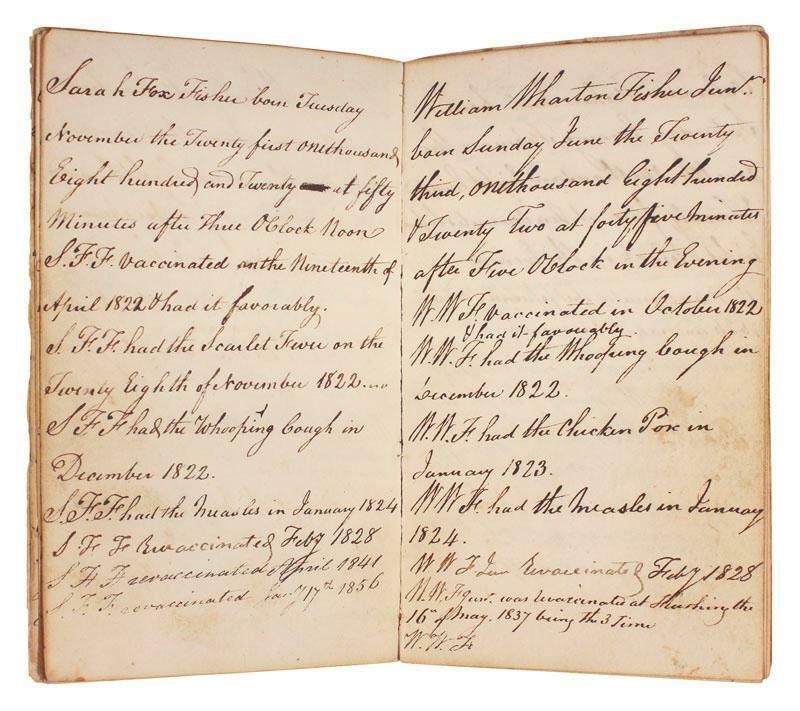 The pages below show the illnesses suffered by Hannah Wharton Fisher (born 1816), her sister Sarah Fox Fisher (b. 1820), their brother William Wharton Fisher (b. 1822), and their brother Thomas Wharton Fisher (b. 1827). Through this register, we can see how the Fisher children underwent a constant round of diseases that are now preventable through vaccination. (Hooray for medicine!) 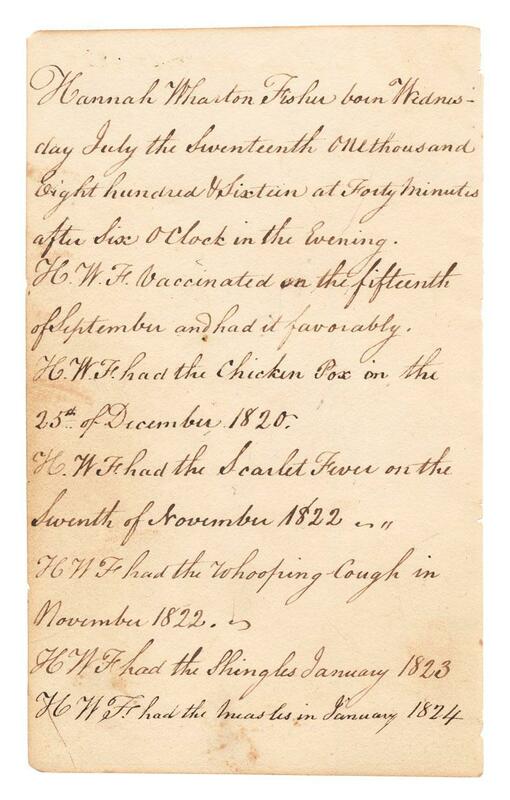 Hannah, Sarah, and William all had whooping cough in November and December of 1822. 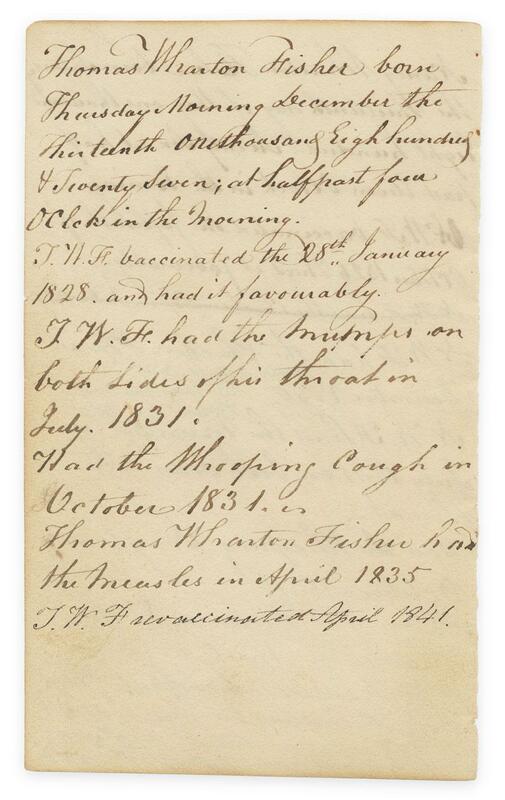 Thomas had “the mumps on both sides of his throat” in July 1831. Measles was a feature of their lives, as well. We can also see how vaccination for smallpox had become a habit for some families by the nineteenth century. In the eighteenth century, when Boston doctor Zabdiel Boylston began experimentally immunizing children and adults against smallpox (on the advice of Cotton Mather, who had been reading about the procedure in the publications of the Royal Society), the procedure was terrifying—some people died after being inoculated. It was also a matter of public debate, as historian Arwen Mohun writes in her book Risk: Negotiating Safety in American Society: Did people have the right to infect themselves in the hope of immunity, if another outcome might be an outbreak? By the early nineteenth century, after Edward Jenner had discovered the technique of using a weaker cowpox strain to vaccinate, the procedure was much less dangerous. It was still, however, controversial. The Fishers’ decision to inoculate each child in infancy—sometimes at a very young age—would have been progressive for their time. Courtesy Ian Brabner Rare Americana.